The domain within your query sequence starts at position 13 and ends at position 118; the E-value for the SCAN domain shown below is 4.23e-58. 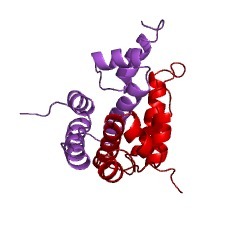 A number of C2H2-zinc finger proteins contain a highly conserved N-terminal motif termed the SCAN (named after SRE-ZBP, CTfin51, AW-1 and Number 18 cDNA) domain. The SCAN domain has been shown to be able to mediate homo- and hetero-oligomerisation [(PUBMED:10567577)]. 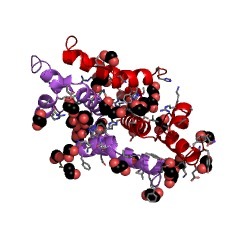 This domain defines a large family of zinc finger transcription factors [(PUBMED:12801630)]. There are 9360 SCAN domains in 9259 proteins in SMART's nrdb database. Taxonomic distribution of proteins containing SCAN domain. This tree includes only several representative species. The complete taxonomic breakdown of all proteins with SCAN domain is also avaliable. Click on the protein counts, or double click on taxonomic names to display all proteins containing SCAN domain in the selected taxonomic class. Isolation and characterization of a novel zinc-finger protein with transcription repressor activity. To identify genes that can repress the expression of growth regulatory molecules, a human fetal cDNA library was screened with a degenerate oligonucleotide that corresponds to the conserved stretch of 6 amino acids connecting successive zinc-finger regions in the Wilms' tumor suppressor/Egr-1 family of DNA-binding proteins. 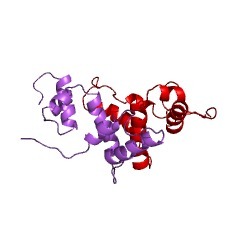 One clone, designated zinc-finger protein 174 (ZNF174), corresponds to a putative transcription factor with three zinc fingers and a novel finger-associated domain, designated the SCAN box. 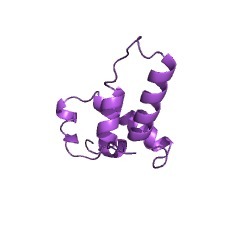 The three Cys2-His2-type zinc fingers are positioned at the carboxyl terminus, while the 65-amino acid finger-associated SCAN box is located near the amino terminus. Chromosomal localization using somatic cell hybrid analysis and fluorescent in situ hybridization mapped the gene for ZNF174 to human chromosome 16p13.3. The 2.5-kilobase transcript from this gene is expressed in a variety of human organs, but most strongly in adult testis and ovary. Fusion of the upstream regulatory region of ZNF174 to the DNA-binding domain of GAL4 revealed that the gene could confer a repression function on the heterologous DNA-binding domain. ZNF174 selectively repressed reporter activity driven by the platelet-derived growth factor-B chain and transforming growth factor-beta 1 promoters and bound to DNA in a specific manner. 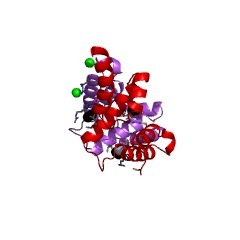 This member of the C2H2-type zinc-finger family is a novel transcriptional repressor.